New Delhi: Arvind Kejriwal was sworn-in as Delhi's seventh chief minister at Ramlila Maidan on December 28, 2013. His Aam Aadmi Party, which made a spectacular electoral debut riding on its promise to rid Delhi of corruption, formed the government in the national capital with outside support from Congress. 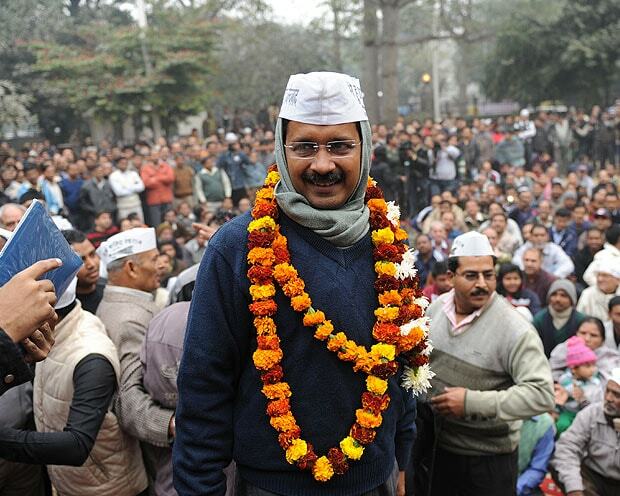 At 45, Arvind Kejriwal is one of Delhi's youngest chief ministers. In his first election, he defeated three-time chief minister Sheila Dikshit in her constituency of New Delhi by some 22,000 votes. A mechanical engineer from IIT-Kharagpur, Mr Kejriwal joined the Indian Revenue Service in 1995. He left his job as a tax official in 2001 to embark on a career as an anti-corruption campaigner that would lead to national fame. After leaving government service, he campaigned to bring in India's Right to Information Act in 2005, which earned him the Ramon Magsaysay Award in 2006. A few years later, he teamed up with activist Anna Hazare to demand the anti-corruption Lokpal Bill, which creates a national ombudsman to investigate venality among elected representatives and bureaucrats. Though their demands went unheeded and their relationship ultimately soured, the campaign planted Mr Kejriwal onto the national stage.The Lokpal Bill was passed by Parliament last week. In his victory speech, Anna did not mention Mr Kejriwal's contribution to their campaign. In November 2012, Mr Kejriwal launched the Aam Aadmi Party, earning the ire of Anna, who wanted it to remain an apolitical movement. Through electioneering for his Aam Aadmi Party in Delhi, the father-of-two campaigned with no security - a status symbol for politicians in the capital. His supporters wielded the party symbol, the broom, and wore white caps. "The broom symbolises a clean sweep of India's rotten politics; the white Gandhi cap connects India to an era "when we had a politics of honesty and a politics of public service," he said in an interview last month. Using tactics popularised by US President Barack Obama, the party raised nearly 20 crores ($3.2 million) through small donations - with supporters' names listed on the website. Congress chief Sonia Gandhi's son-in-law Robert Vadra handed Mr Kejriwal his most memorable nickname in an outburst earlier this year, in which he branded AAP as "mango people in a banana republic".